One of the biggest challenges we’ve faced in the rebuilding of Matilda has been the south wall. When we first bought her, waaaay back in June, that wall was covered in flaking stucco and was scheduled for demolition. Along the way, however, we realized that the porch and sunrooms could be saved. Originally, we thought the sunrooms were late additions because of the stucco and roof line. But as we (and by we I mean our contractors) dug in, we realized that these two rooms were actually part of the house. The ribbon oak flooring was original to the house and the floor joists actually ran through, unbroken. So we were able to save them, rather than demo them. That’s been exciting because it meant that Karl gained a dedicated room for his Baldwin grand piano, and I scored a boudoir right off the master bedroom. Sweet! Not so sweet… was all the mold and water damage. It’s been quite the project to reclaim this space. But, here we are in November almost complete. The rooms are all framed in and walls have gone up. The veneer brick is up, and the masons are completing the grouting. On monday, the acid wash commences, eliminating all the haze and making the new brick look pretty damned close to the original brick. In honor of this milestone, I thought I’d give you a visual tour through the phases of the back wall. New brick for the house. Looking better already! We're saving the porch and back rooms we originally thought we would have to demo. Karl gets a piano room! I get a boudoir! Windows going in! View of the backyard through the south wall windows. South wall of Matilda with sad porch. 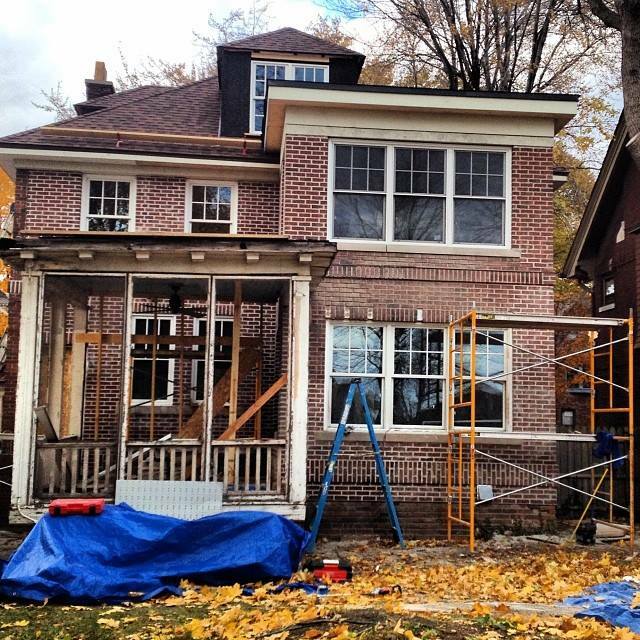 Not that I'm obsessed or anything, but here is how much brick went up on #detroithouse today! The #detroithouse brick is coming! That's grout you see on the lower portion.